"The sumo wrestling bout held on Mount Akazawa in 1177 was intended as a diversion for Minamoto no Yoritomo, yet ironically this event led to the chain of events that resulted in the vendetta of the Soga brothers. The story culminates with a reluctant Yoritomo ordering Soga no Goro's decapitation..."
(a larger image of the complete triptych is available by enlarging the center panel to the right above. Lawrence Bickford in his book on sumo wrestling as presented in traditional woodblock print form notes that this image by Kunisada was an important breakthrough for this artist. It was his first foray into the field of sumo images. The Kawazu-Matano match which took place in the 12th century was of epic significance to the history of sumo. Kunisada's teacher, Toyokuni I, had produced in ca. 1803-04 a somewhat staid and formulaic triptych based on this ancient event, but here he substituted prominent kabuki actors for the onlookers and even the referee was a courtesan/onnagata - an historical impossibility. Instead of looking to his master for inspiration Kunisada went back to the work of Katsukawa Shunei who produced in 1796-97 an exact model for the two struggling combatants. 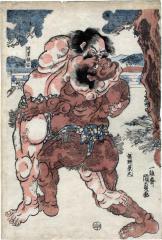 The Shun'ei print mentioned above as a model for this Kunisada print shows two different sumo wrestlers, Banjaku and Narutaki. Narutaki is using the Kawazu-defensive-hold on his opponent. This was "...the wrestling-hold which was for the first time put into practice by Kawazu Saburō Sukeyasu in his famous fight against Matano Gorō Kagehisa in 1176.... In early 1177, not long after the wrestling match, Kawazu was assassinated, while his father was severely wounded in the attempt." Matano made have assisted in this assault because he had held a "...vicious hatred of Kawazu from the very moment he lost the wrestling bout at mount Akazawa. After the murder of Kawazu his sons Sukenari and Tokimune, known as the Soga-brothers, swore to take revenge on the slayer of their father, according to the custom of the time." Source and quotes from: What About Kunisada? by Jan van Doesburg, p. 29.